Combat medics, trauma doctors, and emergency responders all recommend this Israeli Battle Dressing (IBD) or Israeli Emergency Bandage for the treatment of gunshot wounds, puncture wounds, deep cuts, and other traumatic hemorrhagic injuries. 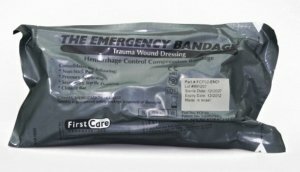 In fact, this is the same bandage that is included in the U.S. Military’s IFAK, or individual first aid kit. This is the large, six-inch bandage, and can be used one-handed for self-treatment or can be applied by a care giver or first responder to help staunch blood flow and stabilize the patient for evacuation or treatment. It can be used on the head, leg, arm, torso, or elsewhere on the body. 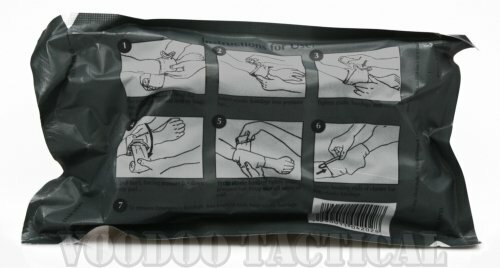 Although primarily designed to help staunch blood flow by applying pressure to the wound site, the 70-inch long elastic portion of the bandage can also be used in the field to construct a sling, to bind a strain or sprain, to secure splints to the broken limb, or even as an improvised tourniquet. The IBD is self contained. It does not require clips, Velcro or pins to use and there are no loose parts that can get lost or misplaced in an emergency. This bandage is vacuum packaged in a compact, sterilized package with instructions for use on the back. The package is small enough to carry in your BDU pocket or a MOLLE pouch. A highly recommended piece of safety gear for those going into harms way.